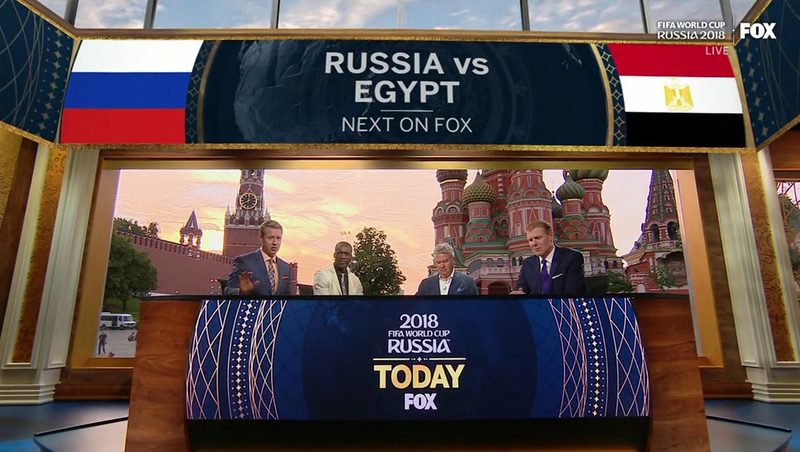 In addition to creating a cohesive look for its coverage of the 2018 FIFA World Cup, Fox Sports and its creative team also created a flexible broadcast booth that matches the graphical look and feel — and integrates with augmented reality. In addition to the sweeping view of Red Square behind the main anchor desk that can be expanded upward using augmented reality technology, the inside of the temporary studio space is packed with detailed Russian influences that go to the level of custom on-set decorative items. To the right side is a wall with cubby-like shelving backed with custom tiles, each influenced by patterns and motifs found in Russian art and architecture. Sitting inside these alcoves are a variety of decorative items, most of which were also custom designs created just for the set — and which again channel Russian influences.